This entry was posted in In the News, Primary on October 31, 2013 by Admin_RyanS. “The Montour Run Bridge No. 6 in North Fayette and Moon Townships, PA, carries Scott Road over the Montour Run just a few miles west of downtown Pittsburgh. The existing bridge was badly deteriorated and needed to be replaced. 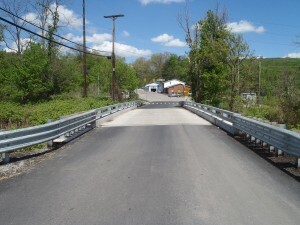 With Scott Road being the only means of access to several businesses on one side of Montour Run, the options for bridge closure were limited…” The full article will be available on our website www.bgfma.org as well as on the Roads & Bridges website http://www.roadsbridges.com/ later in October when the publication is mailed out. This entry was posted in In the News, Primary on October 14, 2013 by bgfmaadmin. Welcome To The Light Weight Bridge Deck Systems Blog! This blog is dedicated to sharing valued information about our organization and the lightweight steel grid deck industry. This entry was posted in Primary on October 8, 2013 by bgfmaadmin.